The MCP4902 device is a dual 8-bit buffered voltage output Digital-to-Analog Converter (DAC). 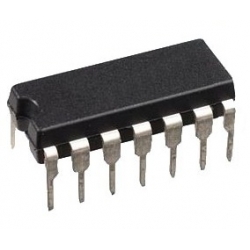 The device operates from a single 2.7V to 5.5V supply with SPI compatible Serial Peripheral Interface. The full-scale range of the device can configure to be VREF or 2 * VREF by setting the Gain Selection Option bit (gain of 1 of 2). Both DAC channels can be shut down by using the SHDN pin or shut down the DAC channel individually by setting the Configuration register bits. In Shutdown mode, most of the internal circuits in the shutdown channel are turned off for power savings and the output amplifier is configured to present a known high resistance output load (500k ohm - typical). The device include double-buffered registers, allowing synchronous updates of two DAC outputs, using the LDAC pin. The device also incorporates a Power-on Reset (POR) circuit to ensure reliable powerup. The device utilizes a resistive string architecture, with its inherent advantages of low DNL error and fast settling time, high accuracy and low noise performance for consumer and industrial applications where calibration or compensation of signals (such as temperature, pressure and humidity) are required.